Pick the Winner of the ING New York City Marathon and Win! Are you looking to create a captivating promotion around a running/endurance event? Are you looking for new ways to elevate the profiles of lesser known stars? 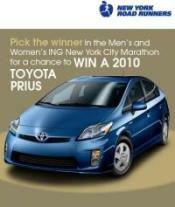 In an effort to drive awareness for the upcoming 2009 ING New York City Marathon and the athletes participating in the race, the New York Road Runners have teamed up with Toyota to create a captivating promotional offer for fans. The Road Runners created a "Pick the Champions" contest that challenges fans with correctly choosing the male and female who will finish first for the chance to win a 2010 Toyota Prius (valued at $30,080). For a chance to win, consumers must fill out the contest's Pick and Drive registration form and then correctly choose both the male and female winners. What is great about the Pick the Champions contest is that it forces fans to go out and research the athletes participating in the race. The promotion serves as a great way for the New York Road Runners to build the profiles of the star athletes competing in the race and create a watch-and-win component to the race that adds a new dimension of excitement.